CHARLOTTE IS BURSTING WITH JOYFUL HOLIDAY FESTIVITIES | South Charlotte Newcomers! Charlotte is brimming with holiday celebrations for families and friends! Joyful and fun activities with the Queen City as your charming host will be sure to thrill the little ones and entertain all! Breakfast is the most important meal of the day and certainly BREAKFAST WITH SANTA is truly THE most important way to begin your holiday! 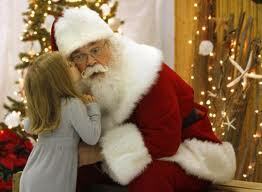 Maggiano’s Little Italy, 4400 Sharon road will have Santa as a breakfast guest on December 20th and December 22nd. Special events for the kids and a delicious chef attended buffet for all to enjoy! Matthews Community Center is serving breakfast with Santa on December 20th. Take a photo with the big guy himself and enjoy creating holiday crafts. For those late risers, BRUNCH with Santa might be more enjoyable. Tom Sykes Recreation Center will host a continental brunch with Santa and his sidekick elves 10:30-11:30am on December 22nd. A more sophisticated young palate will enjoy a HOLIDAY TEA at the Ritz-Carlton on December 20th and 21st, 10:30am until 3:00pm. A special children’s tea menu will be offered. Hanukkah will be celebrated with doughnut making and so much more at the Third Annual Chanukah Wonderland! Enjoy the fun at the Ballantyne Jewish Center on December 21st-23rd. Christmas wouldn’t be the same without all those beautiful, twinkling lights! Enjoy the bright lights of Christmas at a Speedway Christmas through December 30th! See more than 3 million Christmas lights while driving the track and then enjoy the infield Christmas Village. McAdenville is a long-standing tradition amongst Charlotteans. McAdenville calls itself Christmas Town USA with holiday displays of hundreds of thousands of lights to certify its status! The amazing displays will glow nightly through December 26th. Billy Graham Library will offer a Christmas celebration at Christmas at the Library through December 23rd. Enjoy celebrating the birth of Jesus with a live nativity, horse-drawn carriage rides, a Christmas dinner and much more! Sports enthusiasts can enjoy the holidays with their choice of basketball, football, iceskating and hockey! Holiday on Ice is open through January 4th and is great family fun! Located in beautiful Uptown Charlotte, the outdoor skating rink is a terrific way to enjoy the fantastic Carolina sunshine on the cool ice. The Belk Bowl will be at Bank of America Stadium on December 30th. Charlotte will host the University of Georgia and the University of Louisville. This will be an exciting game as the Belk Bowl will, for the first time. feature a matchup between the Southeastern Conference and the Atlantic Coast Conference. Bulldog or Cardinal, this will be a great game! December 20th, 22nd, 27th and 29th will all be opportunities for Charlotte Hornets bball action! Gather the family and enjoy the games at Time Warner Cable Arena! On December 21st enjoy the excitement of Hockey at Time Warner Cable Arena! The Charlotte Checkers will play the San Antonio Rampage. We wish peace and happiness for all Charlotteans and their families this holiday season and in the New Year!